What is a Maktab and why is it important? Maktabs (also known as Kuttabs) are institutes of daily Quranic and Islamic education for Muslim children. They are a lifeline to the preservation and protection of our faith. They provide a deep rooted consciousness of distinguishing between right and wrong and between the permissible and forbidden. It gives them a sense of belonging to a wider brotherhood of the Ummah. It forges a distinct Muslim identity. It helps insulate our children from hypocrisy and disbelief. Below is an abridged speech by the most senior sheikh of hadeeth in England Maulana Yusuf Motala (May Allah preserve him) on the origins of maktab education. (a piece of thick coagulated blood). The above Qur’anic verses are the opening verses of Surah Alaq. These are the first verses revealed by Allah to His beloved Prophet . In these verses Allah says, “Read! (O Muhammad) in the name of your Lord, who has created.” Further, to emphasise, He says, “Has created Insaan (the human being).” In the verses that follow Allah mentions the word ‘iqra’ (read) repeatedly. In the verses with which Allah commenced revelation, He mentions qir‘aat (recitation), taleem (learning), and ta‘allum (teaching). He ends the first revelation with “Has taught man that which he knew not”, thereby stressing yet again the importance of knowledge which is the primary goal of the maktab. This mention of qir‘aat and ilm in the opening verses of revelation is a lesson to Muslims that the preservation of deen (religion), iman (faith) and haq (truth) in the unique manner the Prophet , brought us, i.e., through the medium of wahi and sunnah, can only be possible with ilm. In places where the acquisition of knowledge was neglected, then even if Islam and Muslims remained, they were in a pitiful state. (May Allah forbid) Wherever there is knowledge, this faith of ours will remain in its original purity. Hence, the verse, “Read! in the name of your Lord who has created”, is the very first lesson for us. Who is the teacher? Allah, Glorified and Great! Yes! Allah is teaching His beloved Prophet ; and He in turn is shouldering the responsibilities of an educator. To whom does he teach? Khadijah tul’ Kubra . When the Noble Prophet , returned from the cave of Hiraa and informed our mother of his fear, he also recited to her the verses revealed to him. As you may be aware the first lady to embrace Islam was Hazrat Khadijah, and amongst men, Hazrat Abu Bakr and Hazrat Ali radiallahu anhuma. Muhadditheen (commentators of Ahadith) have written that they accepted Islam at the same time these verses were recited to them; Waraqa bin Nawfal also embraced the new faith. When the Prophet , related to him the event that had transpired, and recited that which had been revealed to him, Waraqa testified to it and promised to assist the Prophet , in his mission. This was the personal and discrete – manner in which the teaching of the Holy Qur’an began. Gradually, as more people embraced Islam the following verse was revealed, “Therefore, proclaim openly that which Allah has commanded, and turn away from the Mushrikoon.” The first concern of the Holy Prophet thereafter was to arrange teaching facilities for the new converts. How could they be taught the Holy Qur’an? The circumstances at the time did not permit the dozen or so Muslims to gather in one place in order to perform Salaah and be taught the Holy Qur’an. For this reason the Holy Prophet , organised their taleem in various homes where they could secretly assemble and study the Holy Qur’an. When Umar Radhiallahu Anhu’s anger abated, and he saw the state his sister was in as a result of the attack, he asked to be shown the parchments they were studying. Upon hearing this request, Hadhrat Khabbab Radhiallahu Anhu re-appeared and made Umar Radhiallahu Anhu perform Ghusl (bath). Umar Radhiallahu Anhu then read from the parchments, on which were written some verses of Surah Tahaa. Thereafter, he went to the HoIy Prophet Sallallahu Alaihi Wasallam, and embraced Islam. This was the very first Maktab established in Makkah Mukarramah. It was in the house of Saeed Ibn Zayd Radhiallahu Anhu, the brother-in-law of Umar Radhiallahu Anhu. The teachers there were Khabbab Radhiallahu Anhu and another Sahabi (may Allah be pleased with all of them). A second Maktab came to be established when the Muslims increased and the former premises became insufficient. It was set up at Darul Arqam, which was near Mount Safa. Here, approximately forty Sahabah Radhiallahu Anhum, would reside on a permanent basis. The Holy Prophet Sallallahu Alaihi Wasallam would also stay there for many days. According to some traditions, once the Holy Prophet Sallallahu Alaihi Wasallam spent an entire month here. During the whole month he would teach the Holy Qur’aan and other religious instructions. A third Maktab was set up in the Sha’ab (glen) of Abu Taalib where the Holy Prophet Sallallahu Alaihi Wasallam and his family were exiled for three and a half years. During this period, the Prophet Sallallahu Alaihi Wasallam would teach the Holy Qur’aan to his family and to those who secretly came to visit him. From the traditions of Makkah Mukarramah, it is clear that these three locations were the main Maktabs in the early days of Islam. There may have been more. Similarly, when the Noble Prophet Sallallahu Alaihi Wasallam came to Madinah, efforts to set up Maktabs were made from the outset. The sole purpose being that the teachings of the Holy Qur’aan should also be made known to the people of Madina Munawwarah. In fact this happened before the Prophet’s Sallallahu Alaihi Wasallam migration to the holy city. He dispatched Mus’ab bin Umair Radhiallahu Anhu and Abdullah Ibn Umme Maktoom Radhiallahu Anhu. The latter was also a maternal cousin of the Prophet Sallallahu Alaihi Wasallam, due to his marriage with Hadhrat Khadijah Radhiallahu Anha. The Holy Prophet Sallallahu Alaihi Wasallam had great affection and love for Abdullah Ibn Umme Maktoom Radhiallahu Anhu, and he too was Fidaa (ready to be sacrificed) for the Prophet’s Sallallahu Alaihi Wasallam sake. Although he was blind, he held a very lofty status in the sight of the Holy Prophet Sallallahu Alaihi Wasallam. Whenever the Holy Prophet Sallallahu Alaihi Wasallam had to be absent himself from Madinah, he would appoint one person to oversee the affairs of the city, and lead Muslims in prayers in the Prophet’s Mosque. Abdullah ibn Umme Maktoom Radhiallahu Anhu was chosen for this purpose on a number of occasions. The Holy Prophet Sallallahu Alaihi Wasallam selected these two companions and sent them to Madina with As’ad bin Zurarah Radhiallahu Anhu. As’ad bin Zurarah Radhiallahu Anhu was the first person from the Ansar (helpers) to embrace Islam at the hands of the Prophet Sallallahu Alaihi Wasallam. He undertook the responsibility of taking Mus’ab bin Umair and Abdullah ibn Umme Maktoom Radhiallahu Anhu, to Madina Munawwarah for the purpose of teaching the Holy Qur’aan. The second Maktab of Madina was established by Rafe’ ibn Malik Radhiallahu Anhu for the people of his tribe. This Maktab was located outside a large house. Here he started to teach the Holy Qur’an. This is the very place where later a Mosque named Masjid-e-Banu Zuraiq was erected. This place is located directly opposite Masjid Ghamamah. Surah Yusuf was the first Surah to be taught at this Maktab. A third place was Masjid Quba. Here the freed slave of Abu Huzaifah namely, Salim Radhiallahu Anhu was Imam as well as teacher of the Holy Qur’aan. Some companions also memorised the Qur’aan under him. This was the biggest Maktab in Madina, the reason being that it was directly enroute from Makkah. Whoever from the Muslims did Hijrah (migrated) would reside here. This place was also known as Baitul Uzzab (house of the lonely ones) for the reason that the Sahabah Radhiallahu Anhum who made Hijrah arrived there alone for the sake of helping the Prophet Sallallahu Alaihi Wasallam and left their wives and children in Makkah in the hands of Allah. At this place there was accommodation and food for all those people who would arrive. The responsibility of their Taleem and the Taleem of the local Ansar was upon Salim Radhiallahu Anhu. From these three Maktabs, the best place of residence was at the house of Sayyidina As’ad bin Zurarah Radhiallahu Anhu. The Sahabah narrate that his house was located in a very open surrounding. From the very initial stage, As’ad bin Zurarah Radhiallahu Anhu had selected this place because people could free themselves from all types of worries and anxieties. The site of As’ad bin Zurarah Radhiallahu Anhu was a vast open field called Naqeeul Khazamaat. The reason for this name was that a special type of grass named Kuzaihma, which is still well known, would grow there. At this Maktab, Mus’ab bin Umair and Ibn Umme Maktoom Radhiallahu Anhuma would teach the Holy Qur’aan. The first Jummah Salaah was also established at this site by As’ad bin Zurarah Radhiallahu Anhu on the instructions of the Holy Prophet Sallallahu Alaihi Wasallam before his arrival to Madina Munawwarah. This place (Naqeeul Khazamaat) is also known as Harre-bani-Bayada. Apart form these Makatib, during the Hijrah from Makkah to Madina, the Prophet sallallaaho alayhi wa sallam continued this work of establishing Maktabs. The Prophet Sallallahu Alaihi Wasallam during his journey, arrived at a place called Ghumaim, there Buraidah Aslami Radhiallahu Anhu came to meet him (he had not yet embraced Islam) and invited him to his home. The Prophet Sallallahu Alaihi Wasallam accepted the invitation and proceeded to his house and invited him to Islam. On that journey of Ghumaim, eighty households embraced Islam. Now just imagine eighty households and in each household there would have been at least five to ten people; such a large number of people embraced Islam at once. The Prophet Sallallahu Alaihi Wasallam commenced his Taleem by teaching them the opening verses of Surah Maryam. Then, he appointed Buraidah Aslami Radhiallahu Anhu as their teacher and proceeded on his journey. Buraidah Radhiallahu Anhu fulfilled this responsibility of taleem in such a manner that he did not even have the opportunity to visit the Prophet Sallallahu Alaihi Wasallam in Madina. When the Prophet Sallallahu Alaihi Wasallam finished the important battles of Badr and Uhud, he arrived at Ghumaim, and completed the teaching of Surah Maryam. Respected brothers and friends, our manner of Taleem is exactly the same as it was in the early days of Islam. The Sahabah Radhiallahu Anhum would learn the Holy Qur’aan directly from the Holy Prophet Sallallahu Alaihi Wasallam both Naazirah (reciting by looking inside the Qur’aan) and Hifz (memorisation of the Qur’aan). This manner of teaching the Holy Qur’aan is so significant and important, that the Holy Prophet Sallallahu Alaihi Wasallam himself initiated it. In other words, the foundation of our whole Deen is based upon this Taleem. This is why the Prophet Sallallahu Alaihi Wasallam formally established these Maktabs and sent senior Sahabah Radhiallahu Anhum to teach at these places. This is, in brief, an account of how the first Maktabs of Islam were established during the lifetime of the Holy Prophet Sallallahu Alaihi Wasallam. If you study and ponder over the history of Muslims who came after the Prophet Sallallahu Alaihi Wasallam, you will undoubtedly find numerous examples and incidents which will clearly testify that this method of Taleem i.e. establishment of Maktabs, has remained the most vital and effective way of retaining and preserving our Deen in its original pristine state. This is also the reason why the children of those people who established Maktabs maintained their Islamic identity. A community which fails to do this will retain its Islamic identity only with difficulty, if at all. في لسان العرب تأتي الكتاتيب من جمع كلمة الكتاب وهي موضوع تعليم الكتاب. بينما قال المبرد: المكتب موضع التعليم، والمكتب المعلم، والكتاب الصبيان، قال ومن جعل الموضع الكتاب فقد أخطأ. وتأتي محصلة التعريفات اللغوية للكتاتيب هو شبه الإجماع على أن المكتب من مواضع التعليم ولكنهم اختلفوا بشأن الكتاب، فبينما يجعله بعضهم من مواضع التعليم، ويعده مرادفا للمكتب، عبر بعض الآخر بالكتاب عن الصبية المتعلمين في المكتب، وعد استعمال الكتاب بمثابة موضع التعليم خطأ. Maktab is a place of study. On this there is a consensus amongst the scholars. However, in regards to Kuttaab, there is difference of opinion. Some say it is the place while others say it is the children that are studying in the Maktab. Those that say it is the children regard its usage of the word “place” as an error. In contemporary Arabic “Maktab” is a desk, while the word “Kuttab” is used for Qur’aanic schools in the Arab world. However, the word “Maktab” is more widespread amongst non-Arab Muslim countries. Maktab also refers to primary schools in many Muslim countries. Maktabs were found all over the Muslim world by the end of 8th Century due to the desire of Muslims to learn the Qur’aan. Even at present, it has exhibited remarkable durability and continues to be an important means of religious instruction in Muslim countries. Prisoners of War from the battle of Badr earned freedom by teaching ten Muslim children how to read and write. One of those children was Zaid Bin Thabit Radhiallahu Anhu (compiler of the Qur’aan) and another child came to his mother crying because the teacher punished him. Umar Bin Khattab Radhiallahu Anhu returned to Madina from the conquest of Jerusalem. The children ran very far to welcome him on Thursday. So he made Friday as a day of rest for the children i.e. a weekend. Before this event, children studied seven days a week. Ghiyath Bin Shabeeb Rahimahullah narrated that when he was a child and was studying in a Kuttab in Qayrowin (Tunisia), Sufyaan Bin Wahab Radhiallahu Anhu the companion of the Prophet Sallallahu Alaihi Wasallam used to pass our Kuttab and he used to give salaam to us and he was wearing a turban the end of which was behind his back. Islamic education of girls used to take place in houses of rulers/wealthy people or Ulama. In some places arrangements were made for boys to be taught in the morning and for girls in the afternoon. Abu Ali Shaqraan Bin Ali Hamadaani Rahimahullah (died 168 H) was a jurist in Tunisia and was known as a great worshipper. Asad Bin Al-Furaat Rahimahullah conquerer of Sicily, Italy (martyred 213H), was a maktab teacher at the beginning of his career. Hasnoon Ad-Dabbaagh Rahimahullah lived in the 3rd century of Islam. Mihriz Bin Khalf Ibn Abi Razeen Rahimahullah (died 413H) used to teach children principles of Deen, Arabic, Akhlaaq and virtues. The sahaabiyyah Shifaa Bint Abdullah Al-‘Adawiyyah Radhiallahu Anha. Aabidaa Al-Jujaniyyah Rahimahallah (d.348H in Baghdad). Aaighur Bin Abdullah Turkiyyah Rahimahallah (d. 540H in Daahistaan). Shams Ud Duhaa Bint Muhammad Al-Waaidh Rahimahallah (d. 583H in Makkah). Aisha Rahimahallah the wife of Shujaa Ud Deen Bin Al-Maagh (d. 655H in Damascus),. There are many more mentioned in the book Taraajim Aa’laam un Nisaa (Arabic). Rulers and wealthy well-wishers used to oversee the needs of the Maktab such as salaries and any needs of students. These well-wishers used to buy fruit for the teachers and honour them by perfuming them on their heads with scented oils to encourage and motivate them to be devoted to teaching. Hashim Bin Masroor Tameemi Rahimahullah was a famous well-wisher of Maktabs in Tunisia. He used to visit the Maktabs and see to their needs. Reading the Qur’aan and its related sciences such as Tajweed and Tafseer in a simple manner. Fiqh of the most essential worship that is repeatedly performed such as Tahaarah, Salaat and Fasting. To learn basic Arabic grammar, memorisation of poetry and various Islamic and linguistic sciences in verse form, literature related to Ahkaam (Shariah rulings) and Aadaab (etiquettes) of Deen, society and Akhlaaq (character). To dispel this darkness of Jaahiliyyah (ignorance) the Ummah is going through today, many efforts of Deen are taking place. The Maktab has become more important and vital than ever before. In numerous countries of the world, the Makaatib have become a means of saving the Imaan of thousands and reversing the tide of Irtidaad (renegading from Islam). It is not possible to fully appreciate the role fulfilled by these Makaatib in watering the seeds of Imaan, which will later flourish, Insha Allah. The global onslaught upon the Ummah is on many fronts. However, the most dangerous and unfortunately the most effective, is the silent battle that is waged on the hearts and minds of the Ummah, especially our children. The battle is waged with smiling faces, alluring fashions, deceptive articles and even “exciting” toys, which leave subtle messages in the hearts of our children. Eventually, Muslim children, with Muslim names but un-Islamic hearts and minds grow up without any spirit of Islam in their lives. Apart from a few practices, which they perform in a ritualistic manner, their lives centre on materialism and chasing “fun.” The true purpose of our existence on this earth is then completely lost. Even when some of these youth do want to turn back to Deen, they fall prey to foreign un-Islamic and extreme ideas dressed up as Islam on the internet or through extreme fringe groups. It is indeed, only by inculcating the awareness of Allah Ta’ala together with a sound knowledge of at least the fundamentals of Deen, that will serve as a protection for our children. Allah Ta’ala declares in the glorious Qur’aan: “Verily We have revealed the Qur’aan and We indeed are its Protectors”. The promise of Allah Ta’ala to protect the Qur’aan-al-Kareem is in fact a promise to protect Deen. It is a promise to protect the efforts whereby the Qur’aan is taught and its message established on the face of this earth. Thus, despite the utmost efforts of the forces of baatil (falsehood) to destroy Deen throughout the annals of Islamic history, Allah Ta’ala alone protected His Deen in its pristine purity. While Allah Ta’ala the Almighty, the All-Powerful, is not in need of any assistance to protect His Deen, however, He selected fortunate souls in every era who were used as a means for the protection of the Deen of Allah Ta’ala. They presented all their resources, physical energies, time and wealth, and thousands even presented their lives. Allah Ta’ala accepted their sincere efforts and sacrifice and made it a means of guidance for millions of people. In the present era, there is a renewed fervour among the forces of baatil to annihilate Islam and the Muslims. However, there is no need for despondency or even fear. There is only a need for us to sincerely apply ourselves with increased vigour, determination and dedication. There is a need for us to present ourselves and beg Allah Ta’ala to accept us as the means for the protection of His Deen. Allah Ta’ala alone will protect His Deen. It will be our good fortune if we are accepted. In Australia, most of the youth have lost their Islamic identity due to not being nurtured in Islamic environments in their childhood or insufficient Islamic Tal’eem and Tarbiyyah. Much energy is expended by different Islamic organisations in trying to encourage these lost youth back to Deen. That is an incredible effort. In reality, the Makaatib nips the “lost Muslim youth problem” in the bud, by creating an Islamic identity from childhood. By the grace of Allah Ta’ala, the Jamiatul Ulama of Victoria via it’s Maktab division, Maktabs Australia, has embarked on this struggle in its own small way. There is an urgent need to establish more Maktabs for providing elementary Deeni education to the children of the Ummah. For many young Muslims, the Maktab is their first contact with structured Islamic teaching and learning; thus it is very important that this early experience is a joyful entry into the world of formal Islamic learning and that it is positive and engaging. Maktabs Australia operates independently. It receives no financial assistance from any other organisation or the government. Various Maktab teachers volunteer their time to administer and train teachers and private Australian donors support with modest donations. Nevertheless, the road ahead is very long. While humbling ourselves in front of Allah Ta’ala in gratitude for what has been achieved, we need to focus ahead towards what has not yet been achieved. May Allah Ta’ala ease the path ahead and accept us all for this noble and great service to Deen and make it a Sadaqah Jaariyyah for us all. Aameen. Why is the institution of the Maktab important? Maktabs are an easy way for 100% of the Ummah to learn the main aspects of Deen (the orders of Allah Ta’ala and way of the Prophet Sallallahu Alaihi Wasallam). Along with reciting Qur’aan, learning of Aqaaid (doctrine), I’baadaat, Mu’amaalaat, Akhlaaq, essential Islamic knowledge can be made common among the Ummah. If a child gives more time than the minumum class time, then arrangements can be made to make them a Haafidh or Aa’lim. Why is Islamic knowledge important? It is the best means by which to attain Tazkiyah (spiritual reformation of individuals and communities). It is the foundation for any successful meaningful and successful worldly life. It is the successful route to winning the pleasure of Allah Ta’ala and easy entry into the hereafter. In the Qur’aan many Ayaat (verses) encourage Muslims to apply themselves diligently to seeking of knowledge. Children are invaluable assets of the future generations. Islam has given particular attention to their education and moral training (Tarbiyaah) as well as for their respect, love, and affection. A major portion of the life of Nabee Sallallahu Alaihi Wasallam was spent in teaching and guidance. The best inheritance that we provide for our children in this life is Islamic Education. We always worry about the standard of education in schools, but why not about Islamic education. Islamic education is essential to protect children from evils and to bring them up as Allah fearing. By virtue of the role of the Maktab, generations will InshaAllah become the torchbearers of Islamic values. Today more than ever we need to empower the educational system (the Maktab). It is proven over the centuries that this approach of sending children to the Makaatib is amongst the most important tools in preserving the Deen of Allah. It is essential to understand that the greatest gift of Allah Ta’ala, for which we are to be eternally grateful, depends primarily on knowledge. Without knowledge, one cannot truly appreciate Allah Ta’ala’s gift of Islam. If our knowledge is limited, then we will always run the risk of losing this wonderful gift of Imaan, which Allah Ta’ala has bestowed upon us. Thus we need to remain on our guard in our fight against ignorance. Providing children with an atmosphere as close to the Islamic ideal as possible, strengthens them to meet and deal effectively with the challenges of living in a highly secularised environment, and in most instances this being a multi-cultural, multi ethnic society, to instil in them a sense of belonging, by equipping them with Islamic knowledge to live in our ever changing world. It is our responsibility as an Ummah (parents, Mu’allims/ahs) to give them, the learners, the education they need in order not to be trapped by this worldly life. There are ongoing challenges, but it is our responsibility to build-up ourselves and our children to achieve Islamic excellence, to be successful in both here and the hereafter. The difference is that Ta’leem relates only to the individual’s intellectual development whereas Tarbiyyah (Islamic Education) is more comprehensive as it encompasses all aspects of the individual’s development. Tarbiyyah will influence the transformation of morally bankrupt, crime-ridden societies where incorrect/wayward behaviour prevails, to harmonious communities, Insha Allah. Pious children, who will make dua for him after his death. If we give our children, the correct and proper Islamic knowledge by sending them to the Maktab, Insha Allah these very children will be the ones who will assist us even whilst we are in our graves. What is an Organised Maktab? The Organised Maktab is a systemised and structured way to run a Maktab with a set syllabus as opposed to traditional Maktabs which would generally be taught with an undefined syllabus. 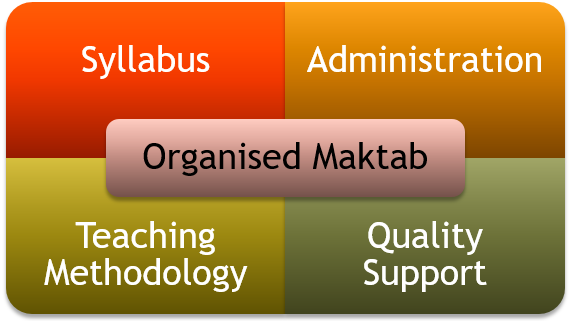 The Organised Maktab provides support and structures to assist teachers in performing their duty. What are the main aspects of an Organised Maktab? When the following four aspects are attended to, then you will have excellence and quality in the Maktab: Syllabus, Administration, Teaching Methodology and Quality Support.